The NSBA Magna Awards have been recognizing school board and school district excellence for more than 20 years. This is the second year that the Magna Awards have focused on equity, or more specifically, removing barriers for underserved students. honor districts across the country for programs that break down barriers for underserved students. A panel of school board members, administrators, and other educators selected the winners from 200 submissions. This year’s three grand prize winners and 15 first place winners were selected from three enrollment categories: under 5,000 students, 5,000 to 20,000 students, and over 20,000 students. 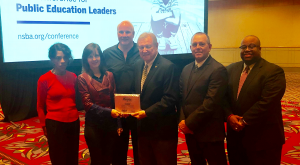 Winners were recognized at a special presentation at NSBA’s 2019 annual conference. Dual language programs provide a well-researched approach for promoting biliteracy, bilingualism, and biculturalism for students. A fundamental goal of such programs is to prepare students for the future with abilities to listen, speak, read, and write in two languages, as well as to develop an appreciation of different cultures. Chatham County’s Dual Language program began at one elementary school in 2005. The principal at the time saw the program as a way to meet the needs of a growing population of English learners. The program, which has been strengthened over time, seeks to help close achievement gaps and further ensure improved academic outcomes for all students. The district now has five Dual Language schools (two elementary schools, two middle schools, and one high school). The initial program expanded to the feeder middle school in 2011 and to the high school in 2014. An additional elementary school program was established in 2012 with that school’s feeder middle school program opening this year. Without the support of the school board, the district would have not been able to continue developing the program into one of the few comprehensive (K-12) programs in the country. Removing Barriers: Chatham’s population is diverse with the following demographics: White, 50.8 percent; Hispanic, 31.3 percent; African-American, 11.4 percent; multiracial, 4.8 percent; Asian, 1.4 percent. The Dual Language program is based on research that has shown high rates of academic success in English and native language for English learners. Several studies document substantial benefits of extended primary language instruction for these students. Equally important is the evidence that world language immersion programs demonstrate that native English-speaking students achieve superior scores on measures of second language proficiency while performing scholastically at a level equal to or higher than their peers who have received all of their elementary school education in English. Evidence of success: Over the past five years, the district has seen a number of academic gains for students in general and for Dual Language students in particular. Those outcomes have been regardless of race, language, or school. For example, all but one of the Dual Language schools have either met or exceeded the state’s growth. The one outlier met growth for four of the last five years. In addition, both Dual Language elementary schools have improved their school performance grade/state accountability measure. One school was removed from the list of schools designated as low-performing. The district also has continued to see an increase in the number of schools meeting their language progress goals.